Baby's first week goes by in a blur...Check out my tips for preparing, surviving, and thriving! Set up ahead of time. Prep your house in advance. Think about where baby will be eating and sleeping. Think about where baby will be when YOU are eating, sleeping, showering, etc. Put together baby sleeping areas and diaper changing stations. Put baby clothes, hats, and burp cloths near the sleeping and changing areas because leaks and spit ups happen. 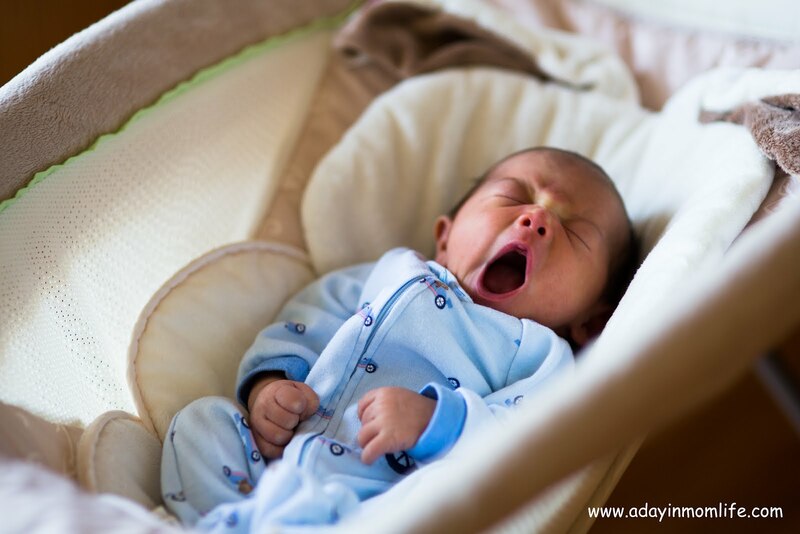 Set up feeding areas in your house - your bed, a couch, a rocker in a nursery - with a variety of pillows and burp cloths. Make sure you will have adequate head and neck support for feeding. 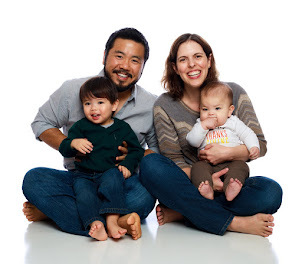 If you are planning to breastfeed, read about what to expect the first month. Familiarize yourself with your breast pump and sterilize your kit, you don't need to pump the first week but it's good to have on hand just in case. 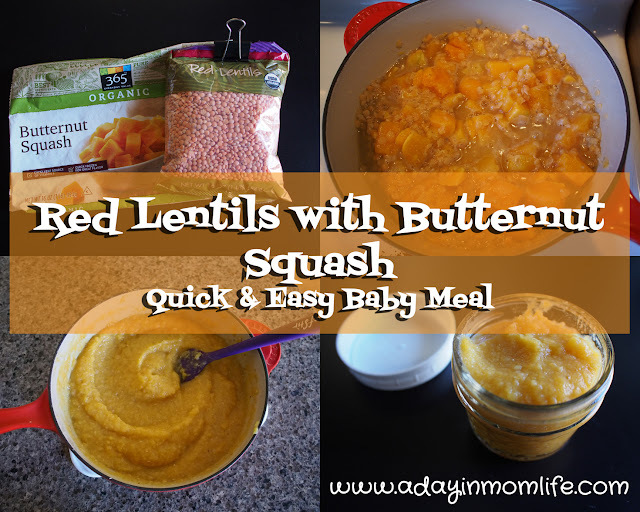 Feed baby and yourself frequently. I'm going to talk about exclusive breastfeeding here. It's not the only way to go. Many moms can't or don't want to breastfeed and I think that's just fine! But as I exclusively breastfed my kids, that is what I know about. 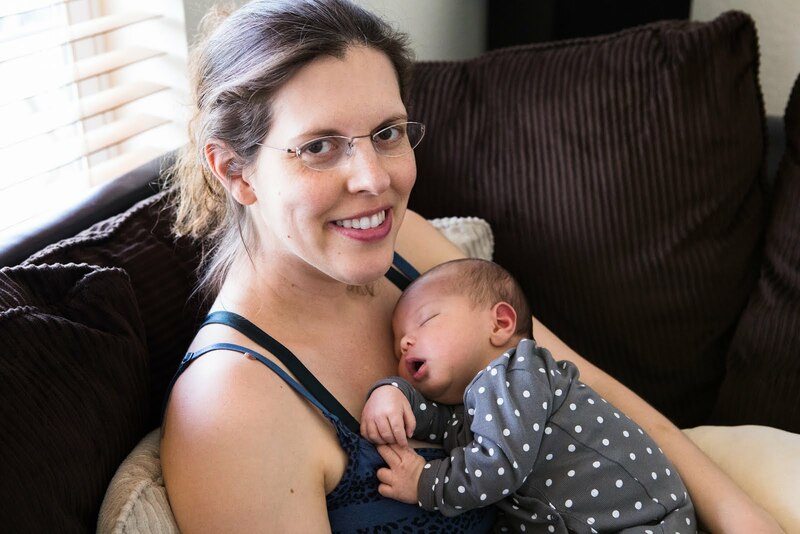 The first month of breastfeeding your first baby is the hardest. After that it gets so much easier and I had an incredibly easy time with my second baby. I hate to hear about moms who wanted to breastfeed stopping during that first month. It gets better! It'd be nice if all you needed to breastfeed was yourself and the baby, but honestly there are some supplies which make it so much easier and more comfortable. 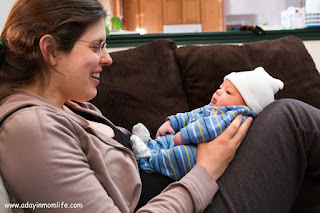 Find my list of recommended supplies in my post Preparing for Baby - Breastfeeding. During the first week baby will eat every 2-3 hours with possible cluster feeding events (pretty much continuous eating). This is when your milk is first coming in and you are first starting to build and regulate your supply. Things will get big and may feel very full. It's common for baby to have a favorite side but resist the urge to always feed on one side as things will get lopsided. But if they do get lopsided, don't worry it's only temporary. If baby is fussy and you think baby may be hungry, feed him/her! Frequent snacking is your friend this first week. My favorite snack was always yogurt (dairy or non-dairy). If your bedroom is upstairs, make sure to have some bedside snacks as well. This isn't the time to worry about your weight and pounds will be dropping off rapidly anyway! If you are hungry, treat yourself to a snack. 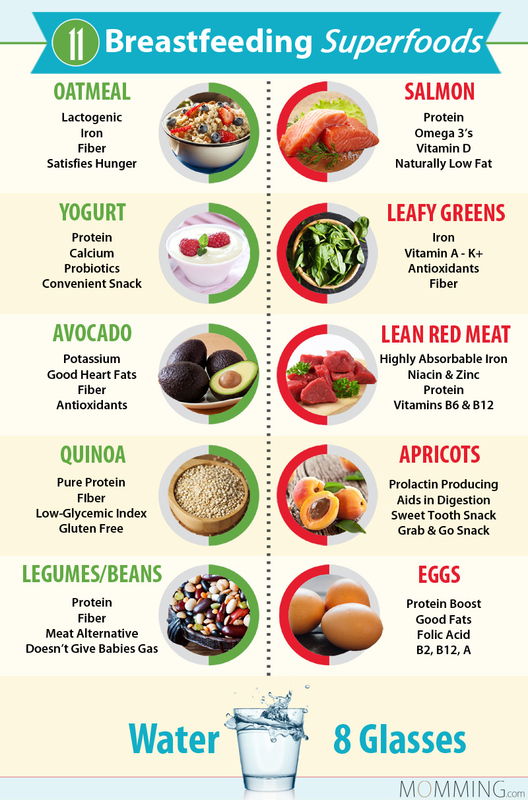 This may seem like the time to splurge if you denied yourself unhealthy snacks during pregnancy, but eating nutrient dense foods will increase your energy and make you feel better. Fruits, veggies, and nuts all make great snacks. Make sure you are getting a wide variety of protein, carbohydrates, and healthy fats. Peanut butter toast, eggs and avocado, oatmeal with fruit, big leafy salads with olive oil dressing, grilled chicken or fish...yum! Find where baby likes to sleep. I used to joke that if I wanted my son to immediately wake up, I would lay him in the bassinet. He just never liked the bassinet. I used a four-sided changing pad as a co-sleeper for both my sons, putting it in between my pillow and my husband's. Using the changing pad worked great for me because I could get baby in and out easily (after my c-sections) and once I moved baby to the nursery the changing pad just went with him! Whether it be a crib, co-sleeper, bassinet, rock n' play, swing, pack n' play...find what baby likes and where baby will take the most comfortable (i.e. longest...) nap. Rearrange items if needed so you have easy access to baby's favorite spots. During this first week, baby's #1 favorite spot may be on you! Don't stress over bath time. Baby doesn't get that dirty so don't worry about doing a quality bath. Baby may have some white cheese (this is called vernix caseosa) in creases and will likely have some flaky skin. Do not scrub at these areas, they will improve once baby can go in a tub after the cord falls off. I sponge bathed both my sons on a towel on my bed. From the pictures it looks like I put a little water in the baby tub with my first son. With my second, I took the basin from my hospital room - this pink or cream smallish square basin is a disposable item, don't feel bad about taking it as they will just throw it away. To keep baby from getting cold, wash baby's body and wrap baby up in a towel. Then hold baby over a tub or basin and use a small cup to pour water to wash baby's hair. 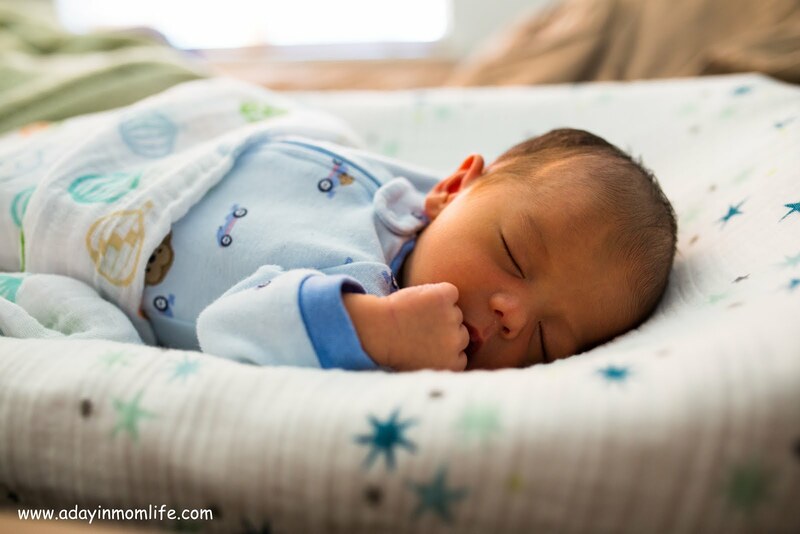 We love Mustela Foaming Shampoo for Newborns! The foam is super easy to use. Lucas liked his second bath better. I remember bathing my first son every other day. Lucas averaged only 2 baths a week until I could put him in the tub. 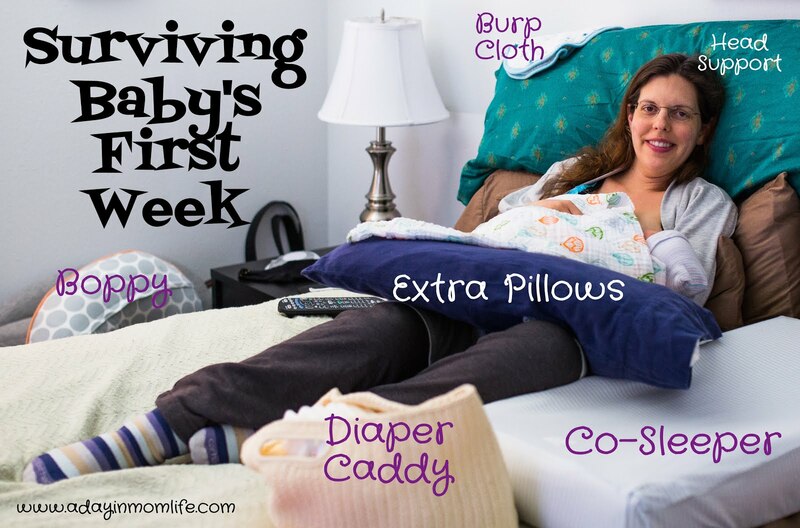 You may be dying to show off your new little one, but the first week is not the time to invite friends over. 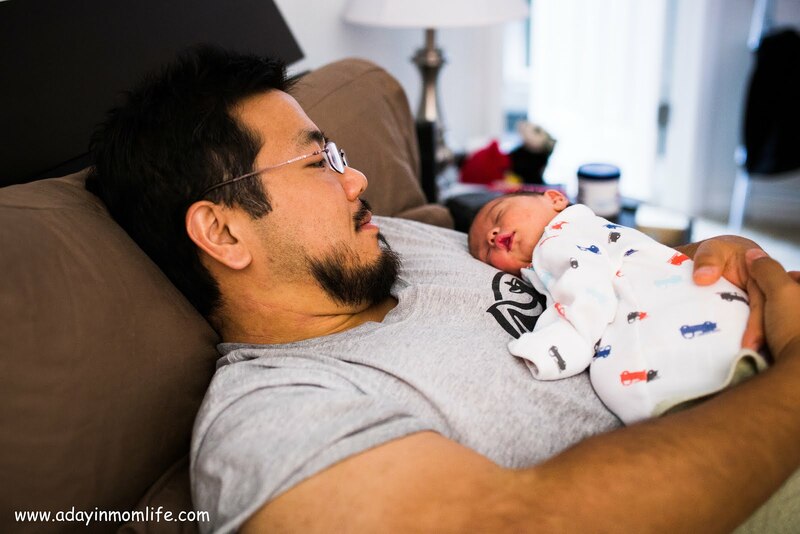 Post some pictures on social media so your friends can oh and ah over how cute baby is, then give yourself time to settle in and bond with your new baby. There are apps which will keep track of everything baby does. I downloaded one when I had my first son. I was supposed to tap which side I was feeding on and then tap for start and stop times. Yea, that didn't even last through one feeding... There are also clips to put on your bra so you can remember which side you fed on first. I guarantee you will be able to remember this most of the time and on the occasion you forget, just feed on the fuller side first. No glow in the dark clip required. I also never wrote down wet or dirty diapers or when my new baby went to sleep and when he woke up. This is just extra work for you and is not necessary! Just say no to baby-logging! BUT - If your baby is not eating well, not gaining weight, not having wet and/or dirty diapers with nearly every feeding, or is sick - then you need to start keeping track of things. You should also be talking with your pediatrician who may ask you to keep a log especially if baby is not gaining weight. 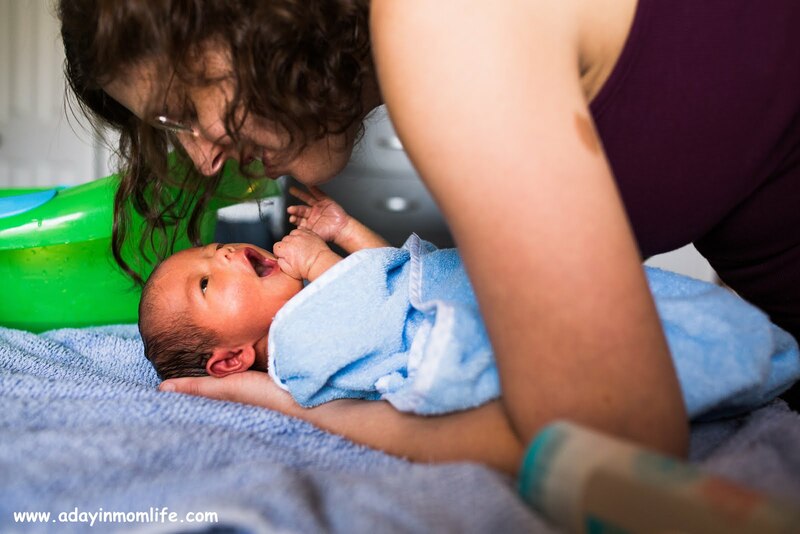 Please share what helped you the most during your baby's first week! This is such a great list, I wish I had read this before having my baby! That's so funny, our baby hated his bassinet too. We tried putting him to bed in there, putting him in already asleep, always resulted in crying within a few minutes. The minute I put him into his big bed in his room, everythign changed and he slept SO much better, I have no idea why!